This spicy pork stir fry is a classic Thailand dish that is not often seen on the menu at local Thai restaurants outside of Thailand. 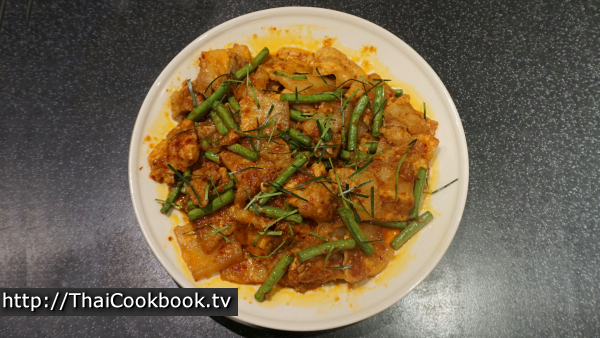 It's made with delicious, but very fatty, pork belly slices cooked in our strong red chili paste with crisp green beans. It's simple to make with just a few easy ingredients. 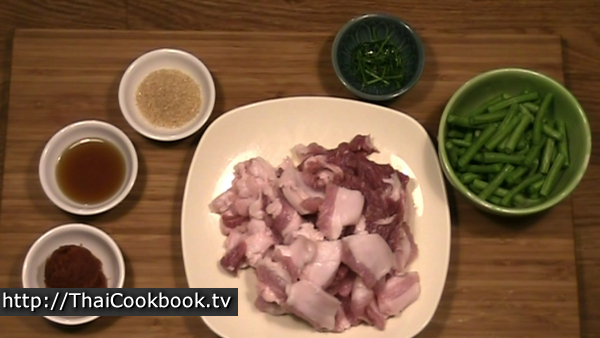 It is traditionally made with pork belly, but you can use lean pork slices for an equally delicious result with less fat. What's in our Spicy Pork Stir Fry. How we make our Spicy Pork Stir Fry. 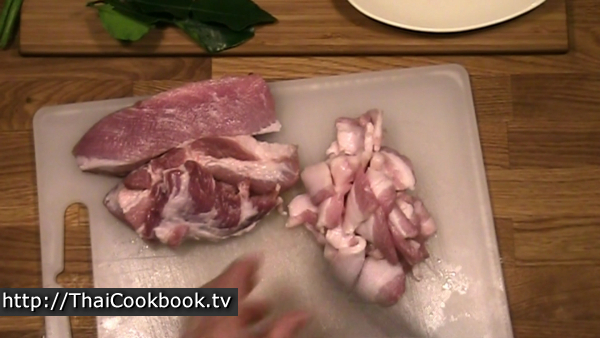 1) Cut the pork belly into thin slices, then fry it for about 2 minutes or until well browned. 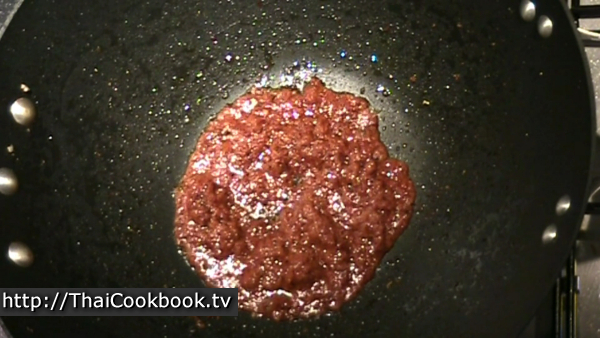 Remove it from the pan, then fry the red chili in the same pan, in about 2 tablespoons of oil until smooth and creamy. 2) Add the fried pork back to the pan and fry with the chili for about 2 minutes. 3) Add the green beans, soy sauce, sugar, and a little water. Fry until hot and smooth. 4) Serve topped with kaffir lime leaf slivers. 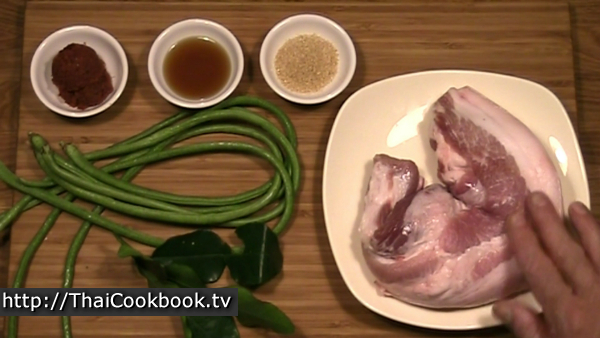 To make this classic Thailand stir fry, start with a nice piece of pork belly with about 50% fat, with the outer skin intact. If you don't like to eat fatty meats, then you can use lean pork slices. 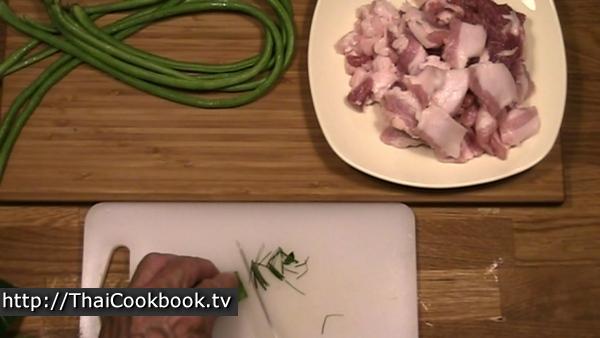 Cut the pork belly into long, 1 inch pieces with the grain of the meat, then cut it into thin slices, across the grain. You'll need about 2 cups of sliced meat. Fold the kaffir lime leaves in half, then slice them into very thin slivers. Cut the yard long green beans into 1 inch pieces. You can use any type of fresh green bean. You'll need about 2 cups of beans. 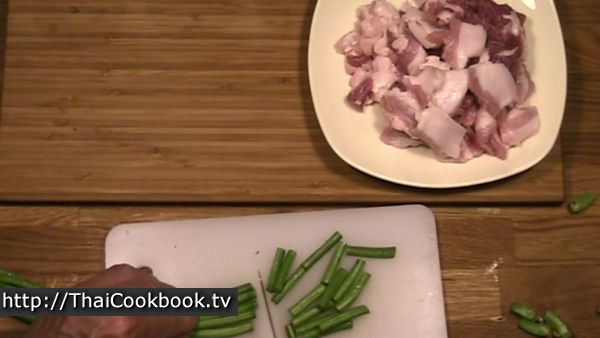 Some people use a lot more, and you'll see this dish done where it is really a green bean dish with some pork, rather than a pork dish with beans. I like to use just enough green bean to add some nice contrasting color. 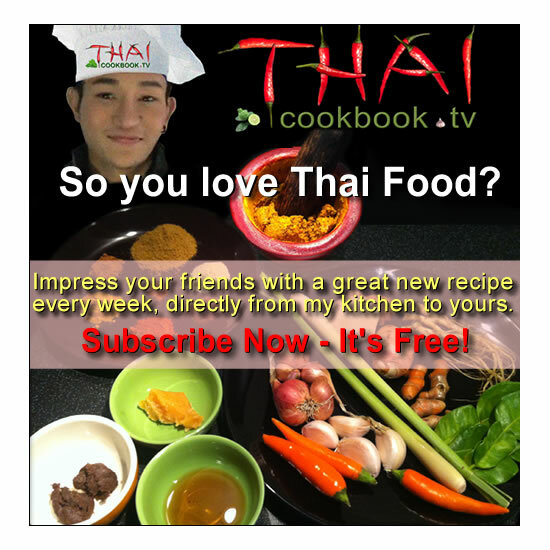 Use about 2 Tablespoon of quality red curry paste. If you want to have more fun with this recipe, then make my homemade red chili paste with This Recipe first. 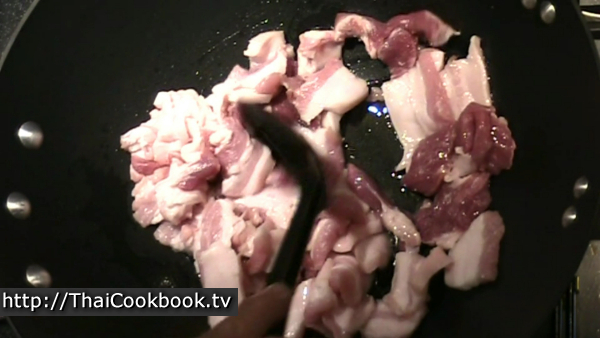 Heat the oil in a deep pan or wok over medium flame, then fry the pork belly until well browned. 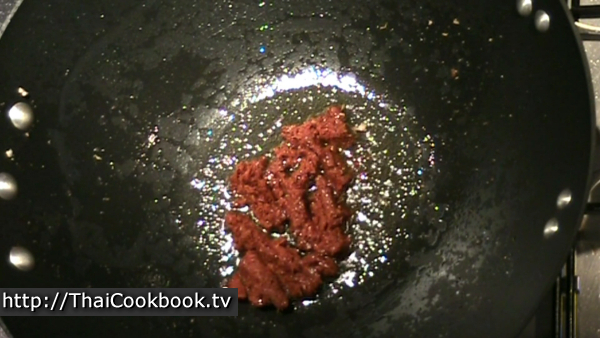 Remove the cooked meat from the pan with a slotted spoon and set it aside. Pour off the excess oil so that you have only about 2 tablespoons left in the pan, then stir whatever browned crispy parts from around the pan back into the oil to get all the flavor mixed in. Add the red chili to the oil and fry together for about 2 minutes over low heat. When the chili is smooth and creamy like this, it's done. 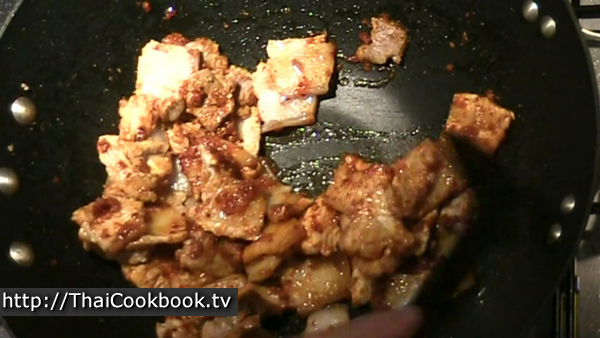 Add the fried pork belly back the the pan and stir it into the chili well. Fry for about 2 minutes over high heat until very hot and sizzling. Add the green beans, soy sauce, and sugar. Stir up well and fry until the sugar melts. Add just a little water to make a small amount of sauce in the pan and pull all the flavors together. Serve on a small plate to be shared at the table. Arrange the green beans so it all looks even. Sprinkle the top with kaffir lime slivers. 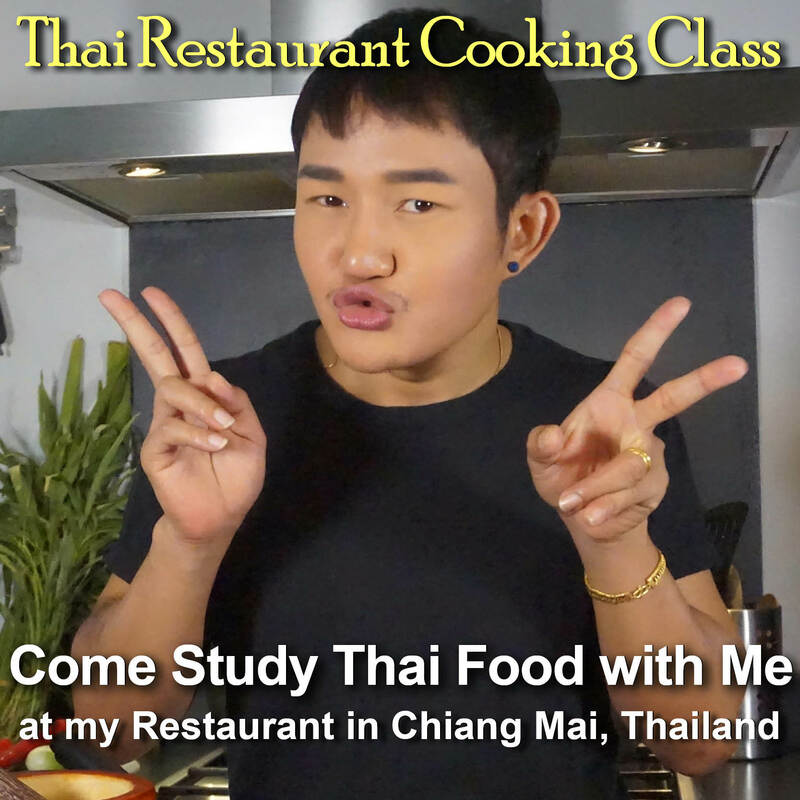 Serve with steamed rice and other foods for a complete meal.